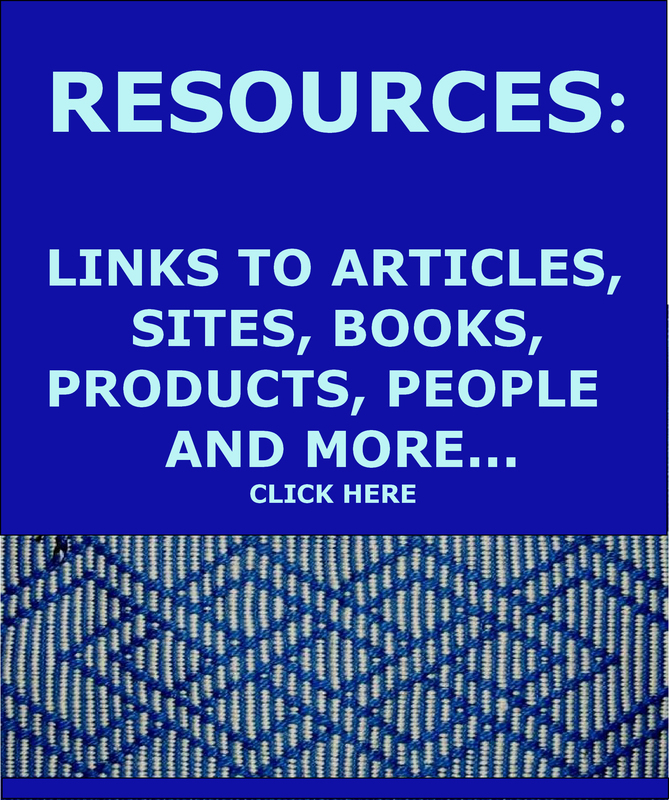 This tutorial assumes that you are competent in setting up a warp for and weaving simple warp floats – instructions and tutorials on this are here. This is a more complex technique as you will be creating floats in both the colors in your warp. I recommend referring to the tutorial in this post and weaving the border design with two-color overlapping floats before attempting this one. 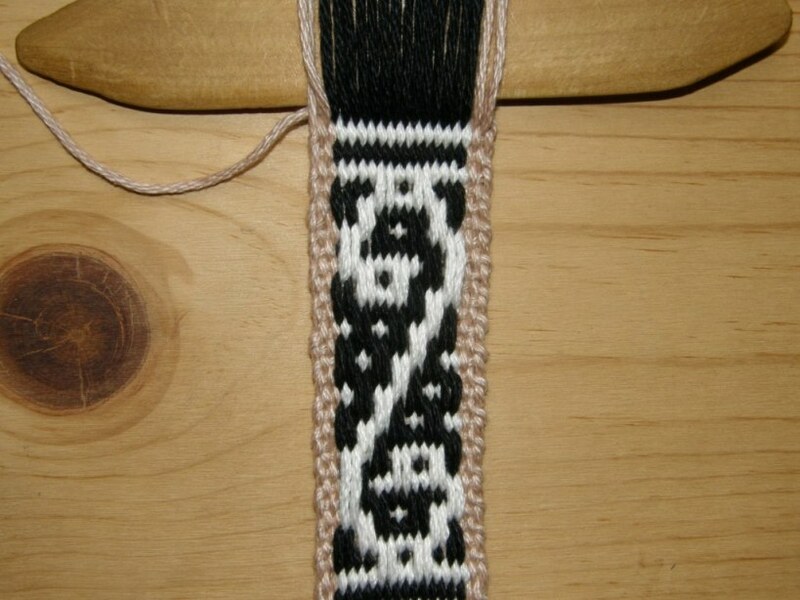 The “S” shaped design is from the border of a yurt band which I wove onto a cell phone pouch recently. To photograph the instructions for this tutorial, I wove the border design using 12wpi cotton. It produces a very thick and not particularly attractive band but it shows up well in the instructional photos. Using a third color for the border is optional. In the cell phone pouch above, I didn’t. You need to set up a warp that looks like this. There are four ends in each of the tan borders. I used fourteen black warps and fourteen whites although you can’t see them all in this picture. As the warps are always floated in pairs, it is best to think of the set-up as being seven pairs of black warps and seven pairs of white. The warps in shed 2 will be controlled by a shed stick and those in shed 1 will go into heddles. The black warps in shed 1 will form the background for the white motif. 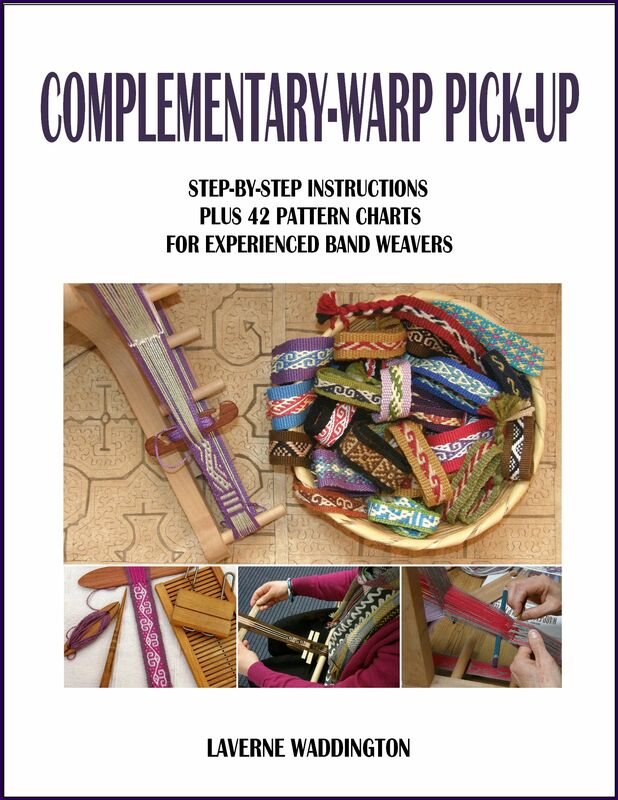 Make a few weft passes through sheds 1 and 2 weaving horizontal stripes to get started. 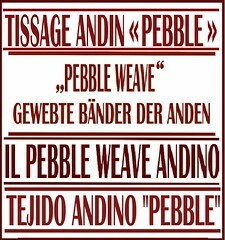 I am passing my weft from left to right through shed 2 and I suggest you do the same to be in sync with these instructions. 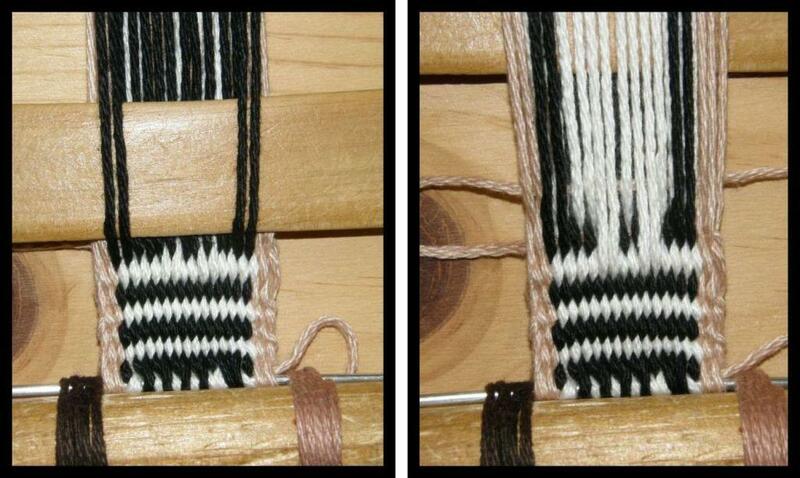 I am using the white warps in shed 2 to form the motif and the black warps in shed 1 to form the background. 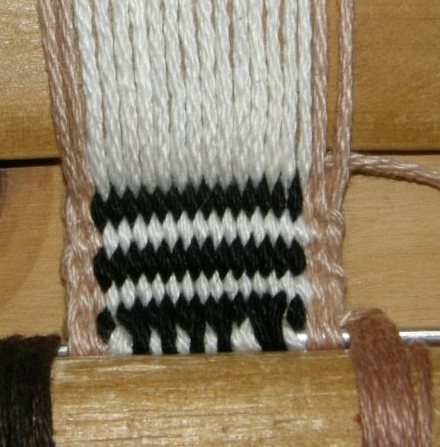 I will start floating warps after having woven a stripe in my chosen motif color, white. Open the white shed, beat and pass the weft. Floating black warps over a white stripe to form the background. LEFT: Select the white warps from shed 2 that are going to float. RIGHT: Add these to all the warps in shed 1, that is, combine the selected white warps with all the blacks. Beat and pass the weft from right to left. The first weft pass detailed above and named ”Sequence 1” is shown on this chart. The red dots mark the white warps that were selected to float. All the rows that are marked with green dots on the chart involve the same sequence of moves, that is, selecting the white warps from shed 2 that are going to float, adding them to all the warps in shed 1 and passing the weft from right to left. I have only marked the warps with red dots in the first couple of weft passes. It is up to you to mark the others! LEFT: Select the black warps from shed 1 that are going to float. RIGHT: Add them to all the warps from shed 2 beat and pass the weft from left to right. 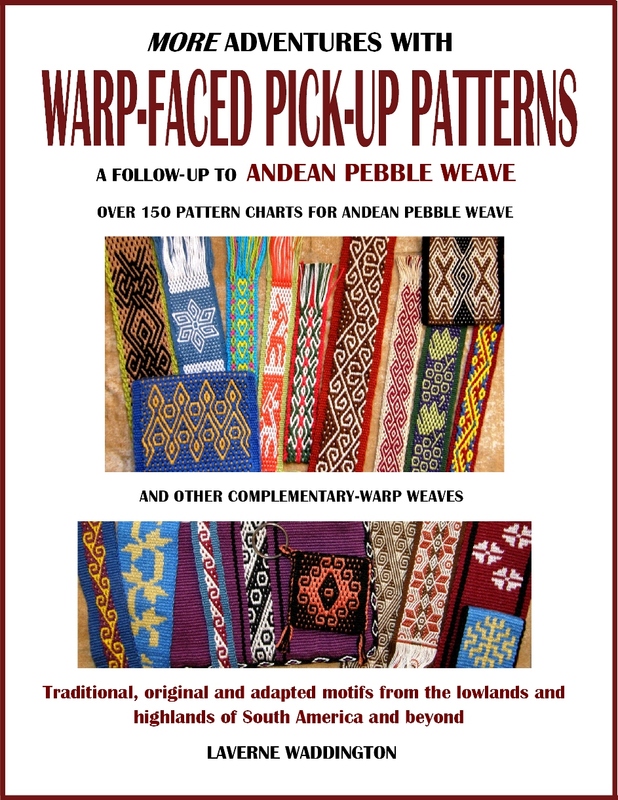 The second weft pass detailed above is shown on this chart. The yellow dots mark the black warps that are selected to float. All the rows that are marked with blue dots on the chart involve this same sequence of moves, that is, selecting the black warps from shed 1 that are going to float, adding them all to the warps in shed 2 and passing the weft from left to right. I have only marked the warps with yellow dots for the first couple of weft passes. It is up to you to mark the others! 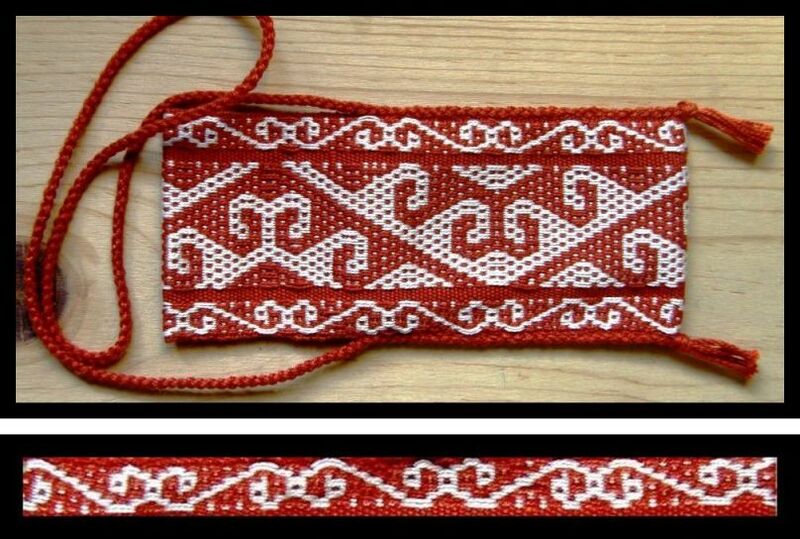 I wove two columns of mirrored S motifs on my belt above and I wove this and another Kyrgyz pattern on a cell phone pouch for a friend below. 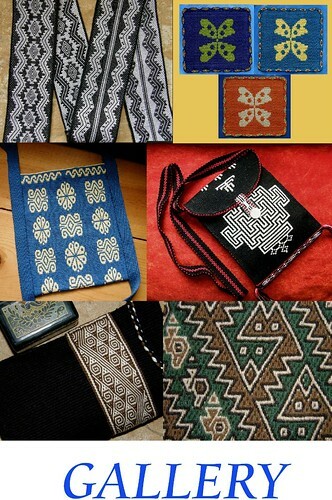 Other Kyrgyz patterns that I wove to make a zippered pouch…. Thanks, Laverne! Will try this next. Your tutorials are wonderful. I have not seen anything in any books that comes close.